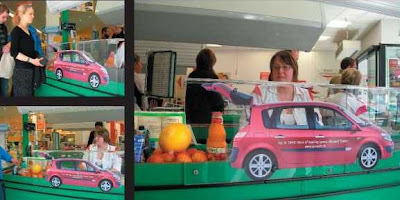 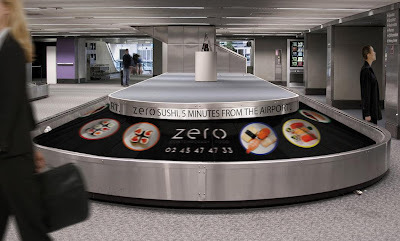 Creative and clever advertising on conveyor belts from all over the world. 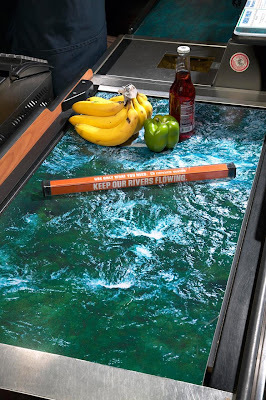 Greenline Gym Conveyor Belt Advertisement: To promote a well-being center, conveyor belts at the supermarkets' checkout were turned into a treadmill. 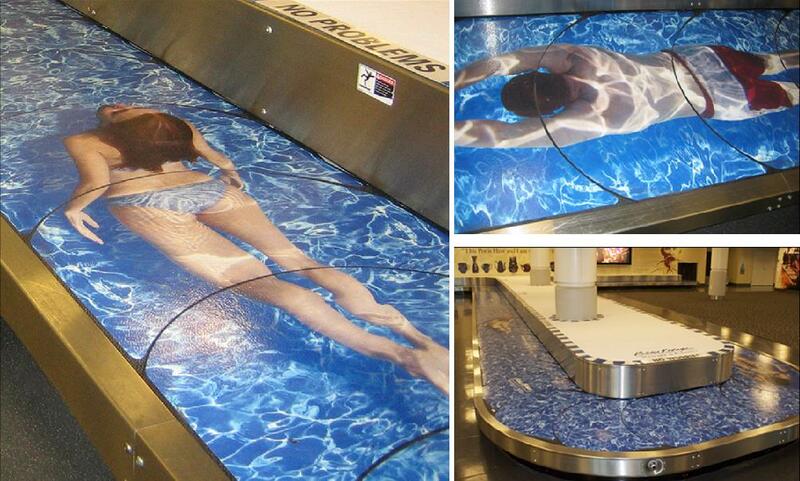 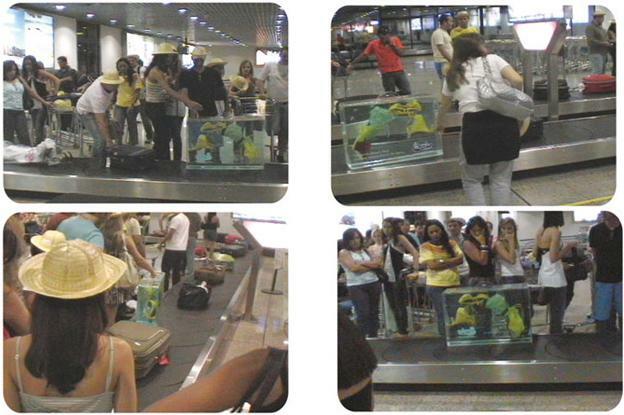 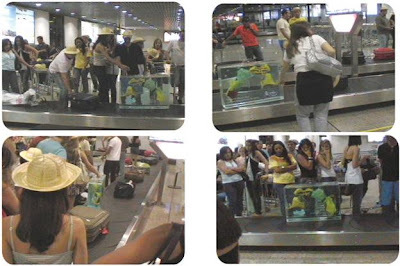 Beach Park Conveyor Belt Advertisement: To promote the park to the tourists, translucent suitcases filled with water along with bikinis and speedos in them were placed along with other suitcases on the baggage carousel at national and international airports. Resort Conveyor Belt Advertisement: At Gulfport-Biloxi International Airport, the baggage belt was transformed into a swimming pool complete with swimmers and playful slogans. 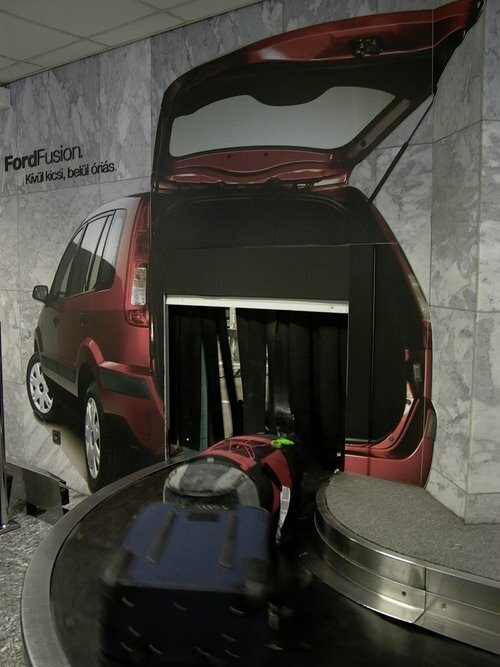 Ford Conveyor Belt Advertisement: "At the Budapest Airport's baggage claim, one's luggage comes out of the trunk of a Ford." 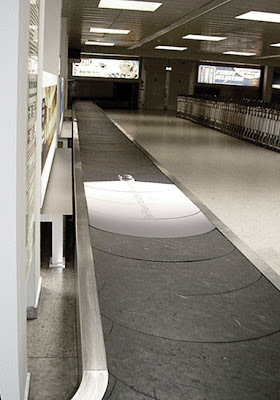 Airways Conveyor Belt Advertisement: These advertisements were created by airways in South Africa to illustrate the care taken by their baggage handlers while dealing with fragile and delicate packages. 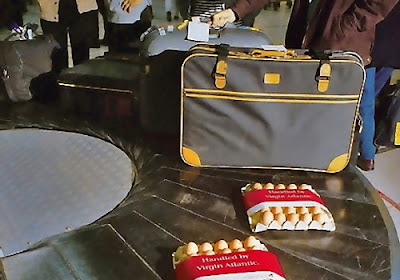 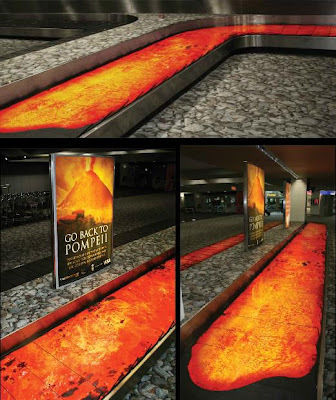 Visa's Conveyor Belt Advertisement: To raise awareness of Visa's sponsorship of the Pompeii exhibit at their National Museum, passengers at the Wellington Airport were greeted with this creative conveyor belt advertisement that ran around the baggage carousel. The message was placed in the lighbox in the middle of the baggage carousel. 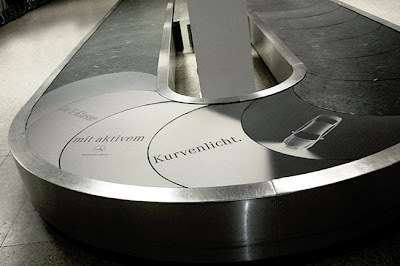 Mercedes-Benz E-Class Conveyor Belt Advertisement: Mercedes-Benz fixed adhesive advertising stickers on two baggage conveyors at the airport in Salzburg (Austria). 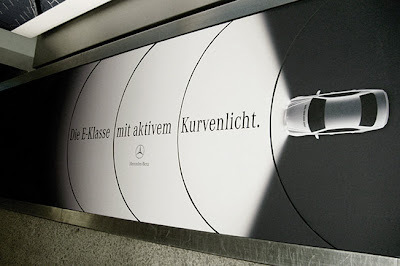 The stickers showed the top views of Mercedes cars with their headlights on in the corners of the baggage conveyor belt, the advertisement illustrates how Mercedes-Benz's Intelligent Light System works. 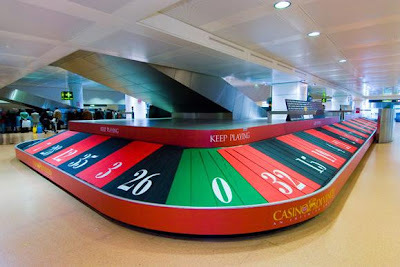 Admcom's Conveyor Belt Advertisement: Admcom an Italian advertising agency turned a regular baggage carousel into an absolutely great advertisement at Venice Marco Polo Airport. 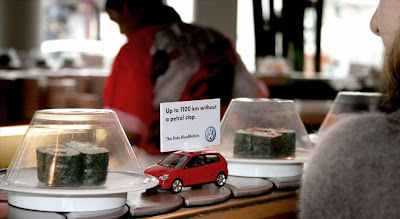 Volkswagen Polo Conveyor Belt Advertisement: "Up to 1,100 km without a petrol stop." 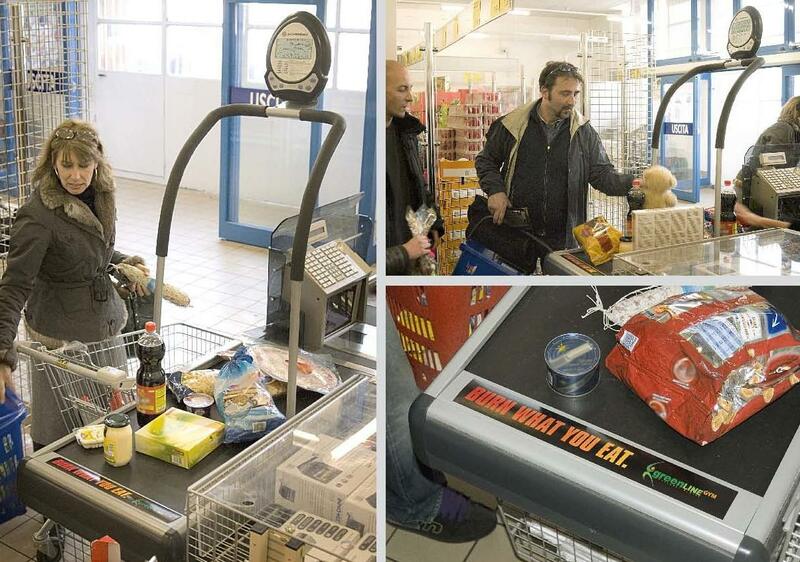 Milky Way Chocolate Conveyor Belt Advertisement: Shoppers were treated to a moving demonstration of a Milky Way bar's stretchy caramel. Denver Water Conveyor Belt Advertisement: "Keep our rivers flowing. Use only what you need."